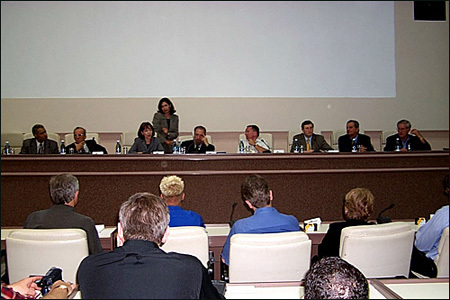 Change "Alamar organized US-Cuba Energy Summit, February, 2006" to "Alamar working with Consensus Inc. staff organized and sponsored the US-Cuba Energy Summit, February, 2006"
Coordinated participation of U.S. executives in international conference organized by Canadian WPO, February 2002. Based in Los Angeles, California, Alamar is headed by Kirby Jones. Alamar assists clients to negotiate contracts to sell agricultural and food products to Cuba, obtain travel licenses from the U.S. Government, and arrange visits to Cuba with an agenda tailored to the interest of each client. Through its personal relationships with Cuban officials, Alamar personnel can provide counsel, insight, and a road map into the workings of the government of Cuba based on three decades of first-hand knowledge and personal contacts. Alamar takes the guesswork out of dealing with a government that has largely been shut off by the United States for more than 40 years. We understand it is difficult to know whom to call or what information is required in order to even begin the process of assessing the market potential. Alamar has saved companies time and expense by helping them develop and undertake a targeted approach to doing business in Cuba. Alamar clients were among the first to sell products to Cuba since late 2001. 1. Market Entry: There are few countries in which business conditions are changing as rapidly as they are in Cuba. There are no countries about which it is more difficult to understand the rules and the most efficient and cost effective way to carry out or get ready for potential business. Alamar helps clients to position themselves for this opportunity. Utilizing its knowledge and relationships developed over 30 years, Alamar has been able to help clients do business, get ahead of its competitors, meet with Cuban business counterparts, and establish contacts with companies already doing business in Cuba. 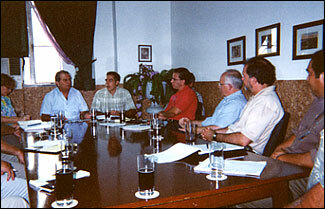 Alamar delegation meets with Alimport officials in Havana. "My German company has been active in Cuba for many years (1995) and I have been in several projects with Alamar Associates, Washington, D.C. Mr. Kirby Jones is very well known and highly respected by Cuban officials in the Industry and Goverment at all levels. He personally understands extremely well the Cuban system and how to get things done in this emerging market."